Russian Roulette by May Freighter is book one of the Helena Hawthorn series. Helena Hawthorn is excited to embark on the next chapter of her life, moving out of her mum and stepdad's house and in with her two best friends for an easier commute to college. Along with her guardian angel, Michael, watching over her, nothing can go wrong, or so she thought. When Michael takes her to the Angel Realm, she ends up connecting her soul to that of Lucious, a vampire on the run, avoiding his trail and fate. Her life takes a more complicated turn when she crosses path with the vampire, who drags her into the middle of his world. Not knowing who trust, and having to rely on herself, Helena fights against the vampires who want to control her. I couldn't put it down! Every chapter left me wanting more! This is best suited for readers that love darker themes. The world that Helena ends up in is dark and twisted, springing off the decisions she makes to save her friend. Helplessness is a large theme in the novel, with the further Helena gets into the vampire world, the more nerve wrecking and violent it becomes. May Freighter gives hope and light to even the darkest of moments, with a heroine that is strong willed and feisty. Helena doesn't always make the best decisions, but she owns up to that and she keeps fighting back. A lot of Helena's experiences are stifling and oppressive, very nightmarish, but I believe she has the strength to fight against the vampires' system. It's clear her story is just beginning. 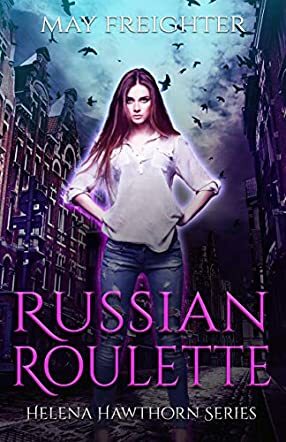 Russian Roulette is dark, addictive, with an air of mystery, and a unique take on fate. I can't wait to read the rest of the series!